A vortex that was part of a giant storm on Saturn slowly dissipates over time in this set of false color images from NASA's Cassini spacecraft. This clockwise vortex spun off the bright head of the storm shortly after the thunder-and-lightning storm erupted in early December 2010. 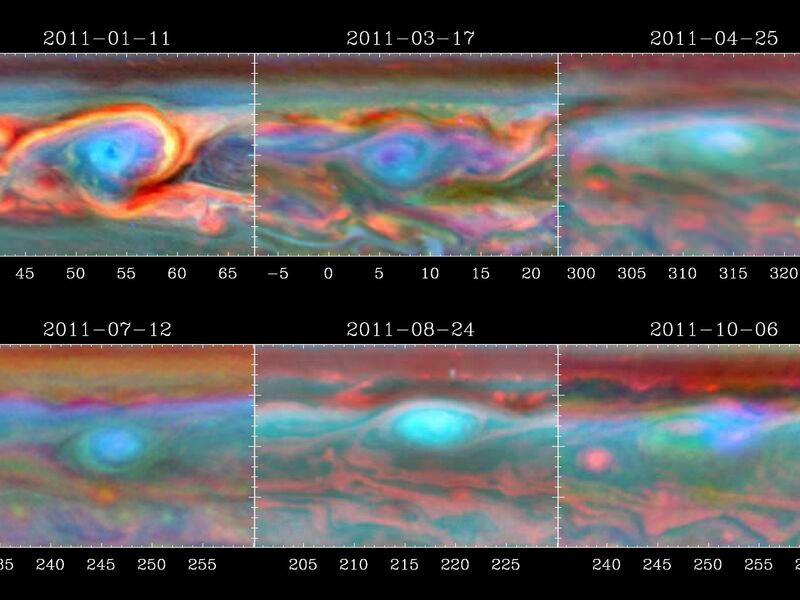 The top left image shows the vortex's most turbulent activity captured by Cassini's imaging cameras on Jan. 11, 2011. It was centered around 54 degrees west longitude and 35 degrees north latitude. At the time, it was the largest vortex ever observed in Saturn's troposphere, which is the layer of the atmosphere where weather occurs. It measured up to 7,500 miles (12,000 kilometers) across. This is comparable in size to the giant storm on Jupiter known as Oval BA, though Oval BA and Jupiter's more famous storm -- the Great Red Spot -- are not thunder-and-lightning storms. Jupiter's vortices are known for their stability and longevity. Precursors to Oval BA formed in the 1930s, and evolved into what finally became Oval BA in the late 1990s. The Great Red Spot has been in existence at least since 1879, and possibly since 1664. Jupiter and Saturn are similar in many respects. However, why Jupiter's vortices are long-lived and why Saturnian ones are so short remain a mystery. 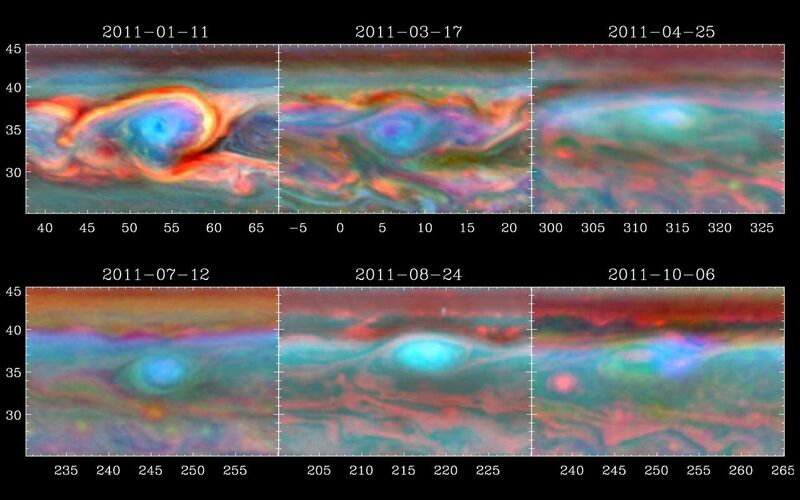 The image in the top middle was taken on March 17, 2011, when the center of the vortex had drifted west to around 6 degrees west longitude. 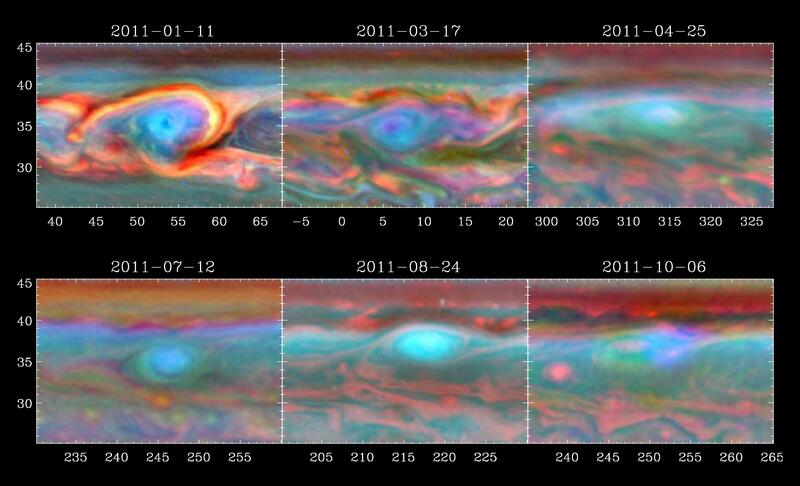 The image on the top right was taken on April 25, 2011, when the vortex had moved to about 315 degrees west longitude. The bright head of the storm was moving more quickly westward than the vortex and collided with the vortex by mid-June. The image at bottom left was obtained on July 12, 2011, after the head and vortex collided. The vortex here is less turbulent and is centered around 247 degrees west longitude. The bottom middle image was taken on Aug. 24, 2011, about four days before the storm's thunder and lightning ceased completely. The vortex is swirling at about 218 degrees west longitude. 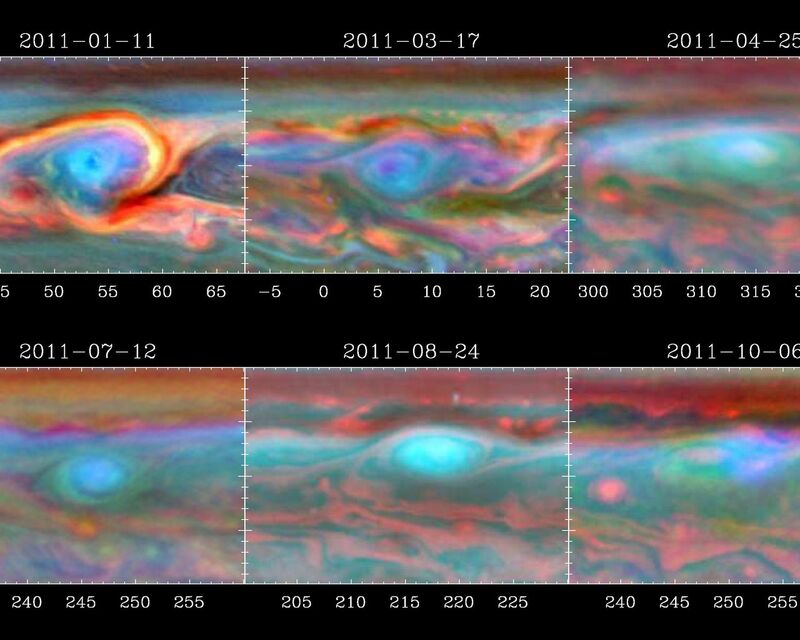 The bottom right image was taken on Oct. 6, 2011, when the vortex had nearly faded away. What is left of the vortex is centered around 248 degrees west longitude.The colors in these images denote the altitudes of the clouds Ã¢â‚¬â€œ with red being the lowest, green being an intermediate level and blue being the highest. White indicates thick clouds at a high altitude. Scientists assigned the red color channel to a wavelength of radiation that penetrates the atmosphere deep down to the top of the tropospheric cloud deck (750 nanometers). They assigned blue to a wavelength that penetrates only to the top of tropospheric haze (890 nanometers). Green represents an intermediate wavelength above the troposphere (728 nanometers). The Cassini-Huygens mission is a cooperative project of NASA, the European Space Agency and the Italian Space Agency. NASA's Jet Propulsion Laboratory, a division of the California Institute of Technology in Pasadena, manages the mission for NASA's Science Mission Directorate, Washington. The Cassini orbiter was designed, developed and assembled at JPL. The radar instrument was built by JPL and the Italian Space Agency, working with team members from the United States and several European countries.